Thelymitra, Sun Orchids growing permanently outside in the garden. To be on the save side, I still grow most of the terrestrial orchids within a glasshouse. That means most of the time, as in late summer (at the end of August) all plants will be brought outside, to let them realise the changing season. With some autumn rain and cool temperatures at night, the plants emerge from the soil. Slug and snail baits are a necessity at this time. End of October, at the latest, all plants will be moved inside the glasshouse. Treatments with aphid spray and snail baits are again necessary as precautions. It is now inside the glasshouse, in November and December, when Caladenia develops its leaf. In Middle Europe, light is a minimizing factor during the winter. Therefore sun orchids, double tails and donkey orchids will be put close under the roof. Until the end of January, the plants will be watered just every two or three weeks, as light and participation is low. The temperature minimum will be kept just above 0°C by a heating system. During the day the temperature rises to 5 or 15°C, depending on sunshine. These are ideal conditions for the vegetative growth of the terrestrial orchids. The first year, I heated the glasshouse to 15 to 20°C during the day, resulting in lots of trouble with fungal infections, sciara and other sucking insects. Early February, as the sun gradually strengthens, watering will be more frequent. Some Pterostylis and other early orchids start to flower. Caladenia deformis opens its flowers at the end of February, a difference of exactly 6 month to the natural habitat in Australia. Early march the first sun orchids flower. Now the radiation rises every day and with nice weather watering will be necessary twice a week. The windows will be opened as often as possible to provide fresh air, when the temperature rises above 20°C. End of April the flowering season is over with several late Diuris, Thelymitra pulchella X longifolia and Thelymitra Helios finishing at last. Now, most orchids show signs of dormancy and watering will be reduced. Early June, the last orchids are dormant and there will be no watering until the end of August when the plants will be moved outside. Some plants fall out of this pattern, as does Pterostylis abrupta, the tableland greenhood from northern New South Wales. It emerges in the hot and dry glasshouse, in the midst of the summer, demanding for water and flowering in August and September. Those plants need special care, not been forgotten and left dry. The evergreen Cryptostylis, wants to be treated different as well. Early May, it will be moved outside to a sunny place in the garden, and it will flower in June. In the glasshouse flower stalks often become very long and bend over. This is especially a problem with Diuris brevifolia, D. drummondii, D. emarginata and hybrids involving these species. These late Diuris, producing tall flower stalks, should best be moved outside on a protected place in early April. Late frost to -3°C are not harmful. The plants will then start into flower at the end of May and become dormant not before the end of June. It makes me wonder again and again how adaptable these terrestrial orchids are. Proceedings, Fourth Australasian Native Orchid Conference and Show, Melbourne, Victoria, October 2000. pp.25 -28. I live in a temperate climate, just 100 km north of the Alps in Middle Europe between the 48° and 49° latitude. My home town Augsburg is situated on the river Lech. The natural sites along the river are famous for its diverse flora. They are home to several species of terrestrial orchids, being very rare in Middle Europe. Along the Lech one can find plants which are more at home in the milder climate of Western Europe as well as a few plants from Eastern Europe, used to a more continental climate and reaching its most western limit of distribution. Winters are very diverse and unpredictable. Most winters are quite mild, in other years, winters can be strong with bare frosts of -15°C or -25°C when snow is on the ground. However, even in mild winters the temperature regularly drops below -10°C during nights. Summers can be cool and wet, or pleasantly warm and sunny. Heat waves to 33°C are rare and usually short lasting. Even, the region is home to some native orchids of Mediterranean origin, which are winter green and summer dormant, this climate seems not suitable for growing orchids permanently outside in the garden bed. Usually, in the wild, winter green orchids grow in a few places, avoiding strong exposure to icy winds and only protected from the most severe frosts by accompanying grasses. Certainly, this orchids can be established in the garden, if some protection is given during the coldest periods of the winter. Since a few years, I also established Australian terrestrial orchids in my garden. The experiments started five years ago. In December 1994, I discovered some leaves in the garden compost. The leaves could be readily identified as sun orchids (Thelymitra), obviously unharmed by snow and frosts during November. They must have been lost as small tuberoids during potting in late summer. As we had snow in November and some mild night frosts, this plants seemed to be much hardier than previously assumed. 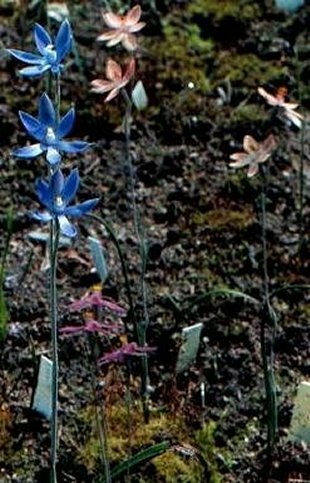 In autumn 1995 I planted some Thelymitra seedlings on a well protected side in the garden. The following winter was exceptionally strong with cold easterly winds and week long bare frosts of -15°C during day and night, resulting in deeply frozen soils. In that winter I lost many native orchids, even some which were established since several years. The sun orchids had no change for survival. Certainly, I had to learn. In autumn 1996 I prepared a special garden bed (about two square meter) for not so hardy orchids and planted about 100 seedlings of Pterostylis and Thelymitra along with some other orchid seedlings preferring acidic soils and native to Portugal. All sides of the garden bed were lined 25 cm deep by hard Styrofoam plates (30 mm), as used for housing insulation, and the garden bed covered by a thick plate (60 mm) made from natural cork, during periods of frost. The bed itself is about 15 cm lowered against the surrounding soil level to give space for the plants, when the bed is covered. There is no insulation against the ground, because the soil from below is the heating system. I don't live in a volcanic area, it is just the energy stored in the soil during the warm season, which will warm the plants in winter, in the covered orchid bed. As these sorts of orchids are winter green and assimilate daylight it is necessary to remove the plates as often as possible, whenever the temperature is above 0° C. All you need now, is a reliable weather forecast. Night frosts are possible from October to early May. However permanent frosts, during day and night only occur from November until March. The snow itself is a very good insulator and the soil temperature will not drop below -5°C, if there is a thick cover of snow. During the whole winter, the temperature under the cork plate did not drop below -4°C, even the winter minimum reached -21°C in a few nights with plenty of snow on the ground. Sometimes, it means quite a lot of work, removing the cover in the morning and putting it back late in the evening, as I don't live nearby to the orchids. During a very mild period in January 1998 I decided not to cover the orchid bed, and the next morning I had to realise, that the temperature had fallen to -6°C. Most of the Australian terrestrial orchids were dead. None of the Pterostylis, but a few sun orchids had survived. In autumn 1998, I planted again about 100 seedlings of Caladenia, Diuris, Pterostylis and Thelymitra. The cork plate was substituted for hard Styrofoam plates (60 mm) as this material shows better insulation properties. The next winter were average, but cold enough for ice skating on the frozen local lakes. However, from now on, the minimum in the covered orchid bed never went below -3°C. Last winter (1999/2000) was mild, with no ice skating, and no frost at all in the covered orchid bed. In the meantime, I know the hardiness of my orchids and the reliability of the weather forecast, so I am often reluctant to cover the orchid bed. That means the orchids regularly get mild frosts, but I am careful when the temperature is likely to fall below -3°C. The less hardy orchids are the Pterostylis and Caladenia, the hardiest are Thelymitra (see table 1). Usually hybrids are hardier than species. The probably hardiest Thelymitra species I grow is the Plain Sun Orchid T. aff holmesii (Hoffman & Brown, second edition, page 267), seeds collected in Albany, Western Australia. These plants showed now signs of distortion, whereas the leafs of T. nuda, seeds collected in Adelaide, South Australia, were partially seriously harmed during a frost of -5°C. Extreme ground minima of -5°C may also occur in the habitat of Thelymitra epipactoides in Victoria, Australia (Calder et al., 1989). In May 2000, about 40 Australian terrestrial orchids, which never ever had been inside a glasshouse, flowered for the first time. The flowering season is about four to six weeks later, as it would be in the habitat in Australia (plus six month for the northern hemisphere). Usually the plants stay green until early or late July, adding to the growing season what is lost in December, January and February, when the bed is sometimes covered permanently for two to four weeks. For many plants, the dormant season is shortened. The first to appear are Pterostylis in September, followed by Thelymitra. Other orchids, which would emerge in late autumn or early winter in Australia, don't emerge before early spring in the garden bed, because it is to cold for much active growth during December, January and February. These are most of the Caladenia and some late Diuris as D. drummondii, D. emarginata and D. brevifolia, actually becoming spring and summer growing plants. Often, these plants just become dormant during the last hot period at the end of the summer. In Middle Europe, there is usually plenty of summer rain, but as the soil drains very well, I probably haven't ever lost one plant to rotting during dormancy. The soil consists of crashed expanded clay with 20 % organic wood fibre added. A stapled ethylene foil underlies the soil layer, just about 6 to 8 cm thick. Therefore, the soil readily becomes relatively dry during hot periods in summer, but never dries out completely. Well, it is wonderful to have these plants in the garden. The flower colour is very intensified, compared to glasshouse grown plants, especially in Thelymitra. Flower stalks are stronger and stabile. In the garden bed you don't have to water and the plants demand not much care, beside of the covering in winter and some snail traits during the whole season. However, there may come an exceptionally winter, and all plants are lost. Calder, D.M., Cropper, S.C. and Tonkinson, D. 1989. The ecology of Thelymitra epipactoides F. Muell. (Orchidaceae) in Victoria, Australia, and the Implications for Management of the Species. Aust. J. Bot. 37: 19-32. Hoffman, N. & Brown, A. 1992. Orchids of South-West Australia. Second edition. University of Western Australia Press.